Jeremy Hunt, the UK culture secretary, is to ask regulator Ofcom to define a means of measuring cross-media power in the UK and consider whether to cap market share of groups which have too much influence over British media; i.e. (for now) News Corp and the BBC. The minister wants Ofcom to create an agreed formula for measuring media ownership that would stretch across TV, newspapers, radio and other media. At present, the only ownership restriction prevents any newspaper owner who accounts for more than 20 per cent of total circulation from owning more than 20 per cent of ITV. 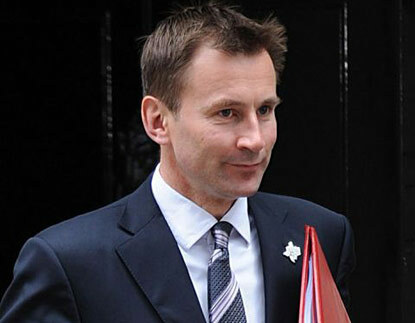 Specifically, Hunt wants Ofcom to examine whether it would be “practical or advisable to set absolute limits on news market share” – a restriction that is as likely to affect the BBC as well News Corp.
Ofcom was asked to review News Corp’s proposed takeover of BSkyB under “media plurality” grounds last autumn, the first time any UK media merger had been examined in such a fashion, amid complaints from rivals that the enlarged company would dominate British media. News Corp’s newspapers had a 37 per cent market share at the time, which would have been combined with the largest broadcaster in BSkyB if the merger had gone through. The newspaper share has now gone down after the closure of the News of the World. With no agreed methodology for influence, Ofcom devised various ways of measuring cross-media power and concluded that a combined News Corp and BSkyB would have too great an influence over news. Ofcom decided to measure “minutes of media use” to devise a common currency embracing newspapers and broadcasters. It concluded that the privately owned News Corp, when combined with Sky, would account for a 22 per cent “share of reference” for British news and that the combined company would reach 51 per cent of all Britons with its news each week. The same data analysis revealed the BBC was easily the largest supplier of news. Its share of reference was measured at 37 per cent, with 81 per cent of the population consuming BBC news each week.